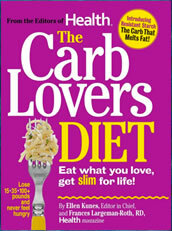 The Carb Lovers Diet was created by Ellen Kunes and Frances Largeman-Roth, editors of Health Magazine. This book dispels the myth that carbs are the enemy when it comes to losing weight and if you select them carefully they can actually help you to release extra pounds. The authors reveal breakthrough research that shows that certain high carbohydrate foods can boost your metabolism because they contain an ingredient called resistant starch. Eating these foods can act as an appetite suppressant and also produce an increase in the rate of fat burning, a reduction in body fat (especially abdominal fat), an increase in lean muscle mass and a suppression in appetite. According to Largeman-Roth, “We are brainwashed against carbs. But it is the wrong message. Carbs are good for you if you choose the right ones and control the portions – carbs rich in resistant starch may be the magic bullet in weight loss.” These foods can help us to feel more energetic, reduce hunger and boost our ability to burn fat. The carb Lovers Diet commences with the strict 7-day “Carb Lovers Kickstart Plan” where you limit your intake of calories to 1200 per day and consume four small meals. This plan will eliminate bloating and allow you to lose six pounds in one week. Following this is the 21-day “Carb Immersion Plan” where you are allowed five small meals a day with 1600 calories and greater flexibility regarding food choices. Once a week, you are allowed to have a treat of chocolate, apple pie, 2 light beers, or 2 glasses of wine. Eat at least one resistant starch food (called CarbStars) at every meal. 25 percent of the calories from each meal should consist of resistant starch with the remainder from lean protein, healthy fats, fruits and vegetables. Create a power pantry (stock up on resistant starch foods). The foundation of this program is the emphasis on resistant starches, which are specific types of starches, similar to fiber, that pass through the body without being digested. By following the suggested meal plan you will increase your intake of resistant starches from the daily average of 4.8 grams up to 10 to 15 grams. The Carb Lovers Diet also includes a collection of 85 recipes with a colorful photograph of each meal. Whole grain bread, whole grain pasta, whole grain cereals, granola bars, brown rice, oatmeal, potatoes, bananas, beans, peas, peanuts, apples, broccoli, cucumbers, Greek yogurt, steak, salmon, eggs, chicken, cheese, chocolate, green tea. Exercise is an important part of The Carb Lovers Diet because it allows you to get quicker results with losing weight. The book includes a body toning workout involving the use of dumbbells that should you perform two to three times a week. On the days that you don’t do weight training it is recommended to do some form of aerobic exercise such as walking or cycling. The Carb Lovers Diet: Eat What You Love, Get Slim For Life retails at $24.95. Good for dieters who like eating carbohydrate foods. Debunks some of the myths about carbs and weight loss. Discourages the use of artificial sweeteners. Includes a meal plan and recipes with colorful photos of every meal. Can be followed by vegetarian dieters. Encourages regular exercise as part of a weight loss plan. Title is somewhat misleading because the plan eliminates some carb foods that many dieters love such as bagels, donuts, pizza and cookies. The 1,200-calorie introductory week may be too restrictive, especially for physically active dieters. Recommends eating green bananas as a resistant starch, which may cause digestive upset. Some of the recipes include ingredients that may be difficult to find. Endorses the use of some processed foods such as corn flakes and potato chips. The Carb Lovers Diet promises dieters that they can lose up to eight pounds in 30 days by emphasizing resistant starch foods. Unfortunately for dieters who love carb foods such as ice cream, cookies and donuts, they will be disappointed because these foods are not a part of the diet. Most dieters will lose weight on this plan, however this is likely to be related to the restriction of calories and increase in physical activity, rather than due to any special qualities that have been attributed to resistant starch.